Regular physical activity is associated with enhanced health and reduced risk of all-cause mortality. Beyond the effects on mortality, physical activity has many health benefits, including reduced risk of cardiovascular disease, ischaemic stroke, non–insulin-dependent (type 2) diabetes, colon cancers, osteoporosis, depression, and fall-related injuries. Despite the benefits of regular physical activity; only 25% of adults in the United States report engaging in the recommended amounts of physical activity (i.e., 30 minutes of moderate-intensity activity on 5 or more days per week, or 20 minutes of vigorous-intensity activity on 3 or more days per week); 29% report no leisure-time regular physical activity; and only 27% of students (grades 9 through 12) engage in moderate-intensity physical activity (30 minutes, 5 or more days per week). According to Healthy People 2010, physical activity is ranked as a leading health indicator. The Physical Activity objectives for Healthy People 2020 is to improve health fitness and quality of life through daily physical activity. Recommendations to increase physical activity have been made for individuals and clinical settings but not for community settings. Increased physical activity has been linked to behavioural, physical, social and environmental correlates. Therefore, community-based interventions have an important role in promoting physical activity behaviour among the people. Information is provided to motivate and enable people to change their behaviour, as well as to maintain that change over time. The interventions use primarily educational approaches to present both general health information (including information about cardiovascular disease prevention and risk reduction) as well as specific information about physical activity and exercise. The focus is mainly on the cognitive skills thought to precede behaviour. The provision of information is intended to change knowledge about the benefits of physical activity, increase awareness of opportunities within a community for increasing physical activity, explain methods for overcoming barriers and negative attitudes about physical activity, and increase participation in community-based activities. 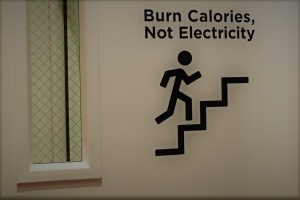 Are the signs placed by elevators and escalators to encourage the use of stairs for health benefits. Campaign messages are directed to large and relatively undifferentiated audiences through diverse media, including television, radio, newspaper columns and inserts, social media, direct mailings, billboards, advertisements in transit outlets, and trailers in movie theatres. Focuses on information provision and skills related to decision making. Health education classes, taught in elementary, middle, or high schools, are designed to the effect behaviour change through personal and behavioural factors that provide students with the skills they need for rational decision making. A systematic review and meta-analysis of the effect of mass media campaigns on physical activity in adults indicated that mass media campaigns may promote walking, but may not reduce sedentary behaviour or lead to achieving sufficient physical activity. Further research is required to examine the effect of mass media campaigns on other measures and types of physical activity. This approach focuses on teaching widely applicable behavioural management skills and structuring the social environment to provide support for people trying to initiate or maintain behaviour change. Interventions often involve individual or group behavioural counselling and typically include the friends or family members that constitute an individual’s social environment. Interventions also involve making changes in the home, family, school, and work environments. increasing moderate to vigorous physical activity (MVPA) of students during PE class without necessarily lengthening the class time. For examples, changing the activities taught (e.g., substituting soccer for softball) or modifying the rules of the game so that students are more active (e.g., having the entire team run the bases together if the batter makes a hit). Research suggests there is strong evidence that school-based PE is effective in increasing levels of physical activity and improving physical fitness. Using didactic and behavioural educational efforts to increase physical activity levels among college student. The aim is to set long-term behavioural patterns during the transition to adulthood. It includes supervised physical activity in the class. The entire family may be helpful in determining how to best promote behaviour change among all its members. Many disease risk factors (behavioural and physiologic) aggregate within families and family is a major source of influence for children in the modeling of health behaviours and is, therefore, an appropriate target for intervention. Moreover, a supportive social environment has been shown to increase the maintenance of behaviour change. Programs typically can include joint or separate educational sessions on health, goal-setting, problem-solving, or family behavioural management along with some physical activities. Obesity-related intervention programs can use parental involvement in developing an environment that fosters healthy eating and physical activity among children and adolescents. These interventions focus on changing physical activity behaviour through building, strengthening, and maintaining social networks that provide supportive relationships for behaviour change. This change can be achieved either by creating new social networks or working within pre-existing networks in a social setting outside the family, such as the workplace, The worksite wellness program also has potential to increase employees’ productivity, reduce absenteeism, and increase morale. For example, interventions included sit-stand desks, introduction of walking during breaks, reducing sitting time, setting up a “buddy” system, making a “contract” with others to achieve specified levels of physical activity, or setting up walking or other groups to provide companionship and support while being physically active. There is strong evidence that social support interventions in community settings are effective in increasing levels of physical activity, as measured by an increase in the percentage of people engaging in physical activity, energy expenditure, or other measures of physical activity. Texercise, a program developed by the state of Texas, promotes healthy lifestyle choices to help residents age and live their best. Texercise provides technical and motivational help during your program, including incentives for participants. These are designed to provide environmental opportunities, support, and cues to help people develop healthier behaviours. The goal is to increase physical activity through changing social networks, organisational norms, and policies, the physical environment, resources and facilities, and laws. Creating or modifying environments to make it easier for people to walk or bike is a strategy that not only helps increase physical activity but can make our communities better places to live. Communities designed to support physical activity are often called active communities. The Guide to Community Preventive Services recommends strategies to increase physical activity that are related to walkability—community-scale urban design, street-scale urban design, and improving access to places for physical activity (including providing maps and descriptive information). All of the above-mentioned factors affect physical activity levels, regardless of individual motivation and knowledge. The implementation of these strategies will require hard work and widespread policy change which would lead to longer-lasting lifestyle changes, that ultimately will prevent preventable disease, lower health care costs, and save lives. To accomplish the goal of achieving high rates of physical activity, physicians, physiotherapists, physiologists, behaviour medicine specialists, sociologists, recreation specialists, architects, city planners, and engineers should work together in order to engage schools, worksites, religious institutions, and communities, thereby creating opportunities to promote physical activity. ↑ Abioye AI, Hajifathalian K, Danaei G. Do mass media campaigns improve physical activity? a systematic review and meta-analysis.https://www.ncbi.nlm.nih.gov/pmc/articles/PMC4626000/#b10-permj19_4p0084 Archives of Public Health. 2013 Dec;71(1):20.